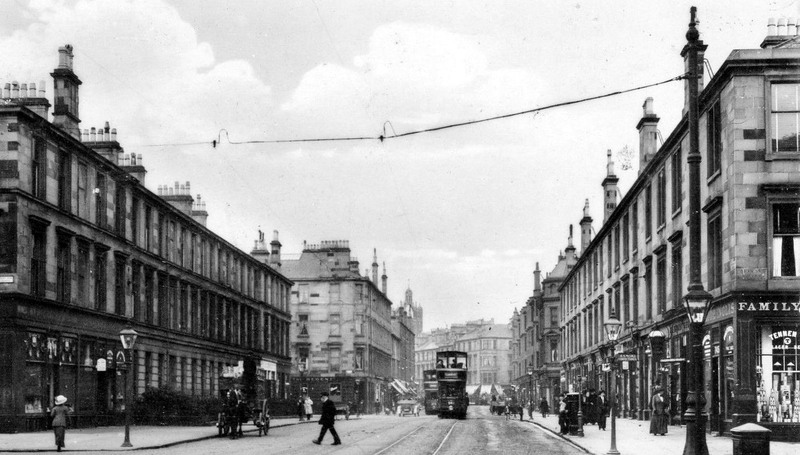 Explore the development of Strathbungo through the ages. King David I (1124-1153) grants lands of Govan to the See of St. Kentigern of Glasgow, at the time of consecration of Glasgow Cathedral. 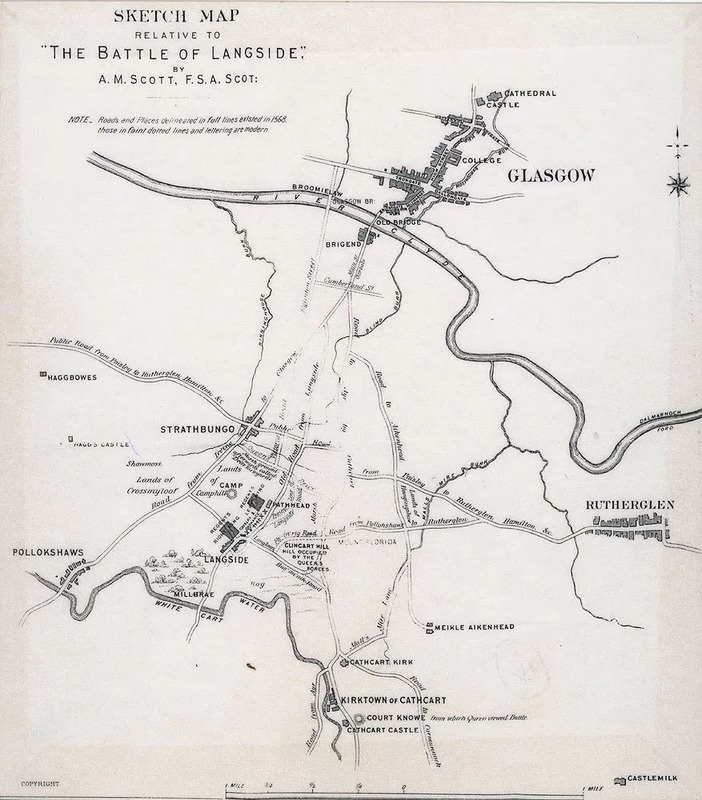 The Battle of Langside is fought on 13 May 1568 between the forces of Mary, Queen of Scots and her half-brother James, Earl of Moray and Regent of Scotland in the vicinity of Queens Park, ending in defeat for Mary. The participants gave their names to the streets of Strathbungo. The Maxwells of Pollok were supporters of Mary. 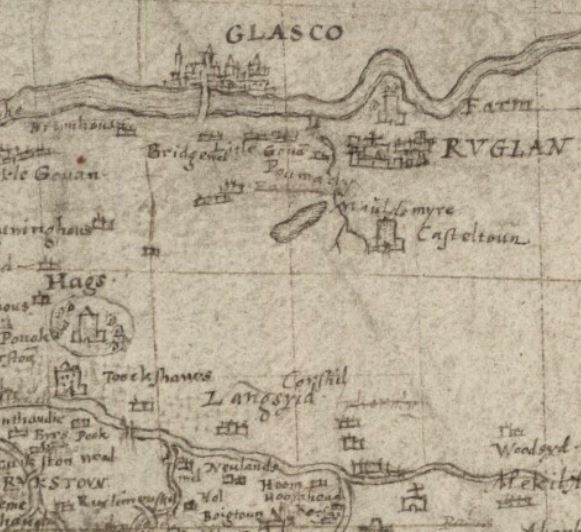 The Maxwells of Pollok acquire the lands of Haggs, Shields and Titwood by feu from the Archbishop of Glasgow. 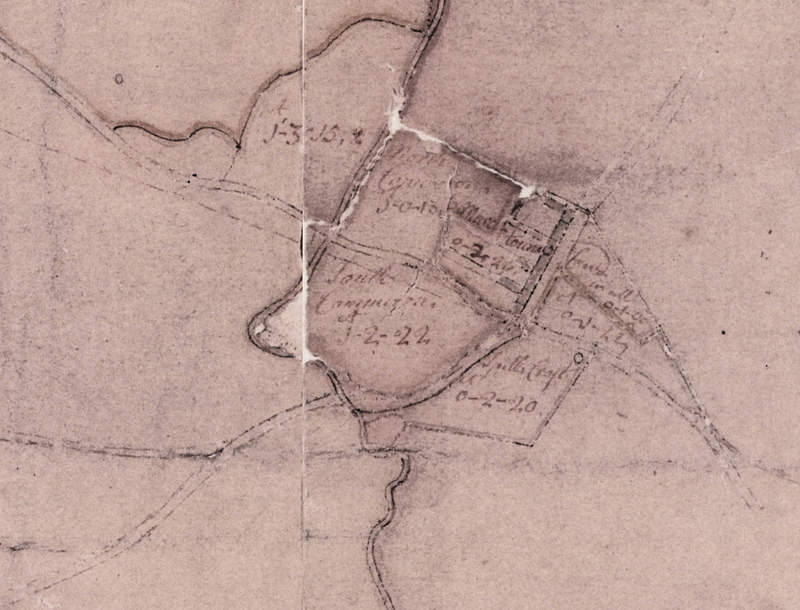 First detailed map of Strathbungo, by Robert Ogilvy for the Maxwells. They refer to it as Marchtoun. First Strathbungo Parish Church built 1839-40, architect Charles Wilson. Govan Sessional School opens in Nithsdale Street. Glasgow, Barrhead & Neilston Direct Railway opens on 29th September, running from Glasgow Southside Station (roughly at the Brazen Head pub, Gorbals) to Barrhead. The first stop is Pollokshaws (West); there is none yet in Strathbungo, and the line runs through open fields to the west of Strathbungo village. 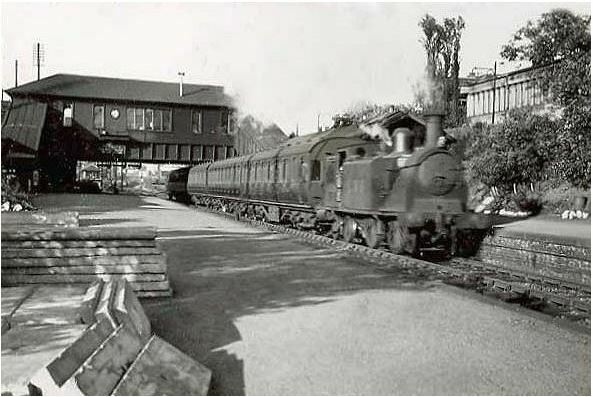 The picture shows a British Railways train passing through Strathbungo Station in 1948. 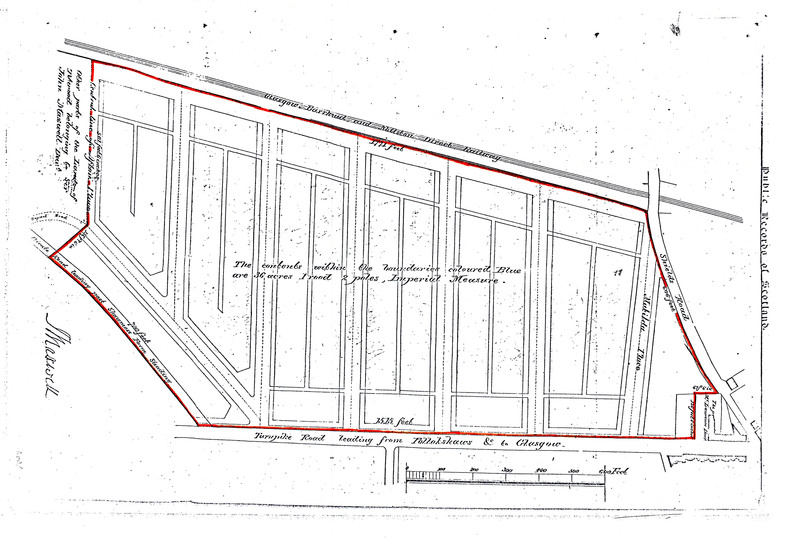 Land between railway and Pollokshaws Road is feued to William Stevenson and John McIntyre by Sir John Maxwell of Pollok. 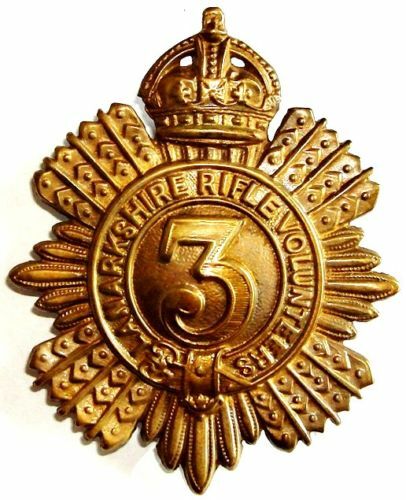 On 8th August 1860, the Strathbungo based Third Lanarkshire Rifle Volunteer Corps is formed from a number of smaller corps. The day before, the volunteers had marched past Queen Victoria at the Royal Review in Edinburgh. The parade ground was just north of the village, where they later built a new Drill Hall in Coplaw Street, which still stands today. Queens Park opens. Pathhead Farm was bought by the Thomson family from the Maxwells in 1799. Neale Thomson sold it for £30,000 to Glasgow Corporation in 1857, and between then and 1862 it was laid out as a public park partially to the design of Sir Joseph Paxton, architect of Crystal Palace. Despite various assertions to the contrary, it remains unclear which queen it was named after, Mary, or Victoria. Regent Park Terrace - the first two of the four tenements along Pollokshaws Road are completed, from Nithsdale Road to Queen Square. The first terrace is seen on the left of the picture. 11-17 Moray Place built 1862-4. Architect & builder unknown. Regent Park Square, and the north side of Queen Square, built by Daniel McNicol, 1864-65. 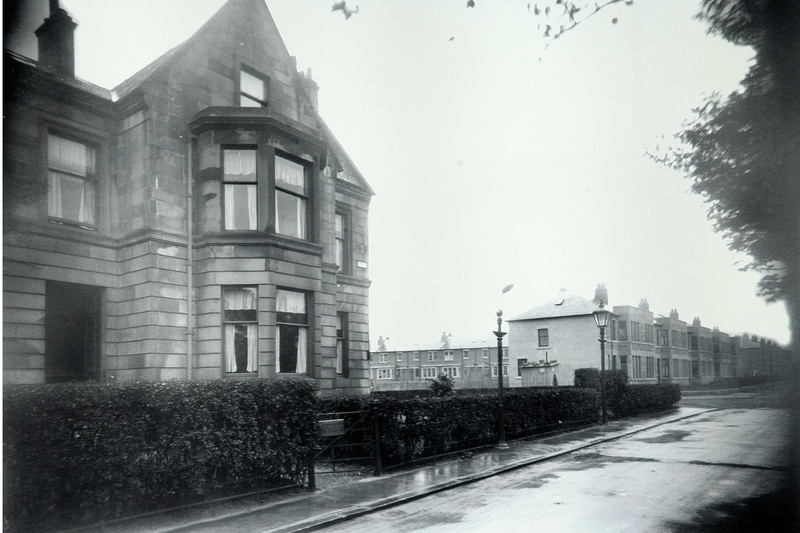 Regent Park Terrace - the third tenement on Pollokshaws Road completed, between Queen Square and Prince Square (later Marywood). 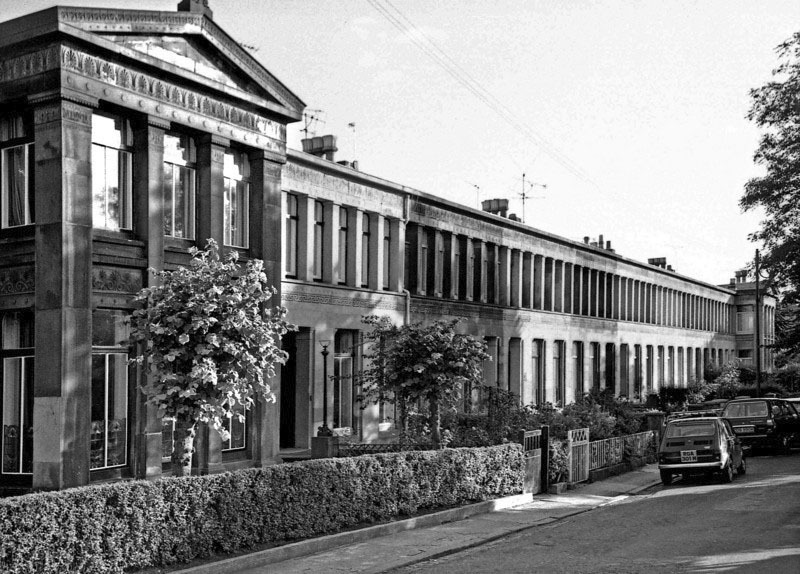 Regent Park Terrace - the fourth and final tenement on Pollokshaws Road completed, between Prince Square (later Marywood) and the old Haggs Road, later Titwood Road. 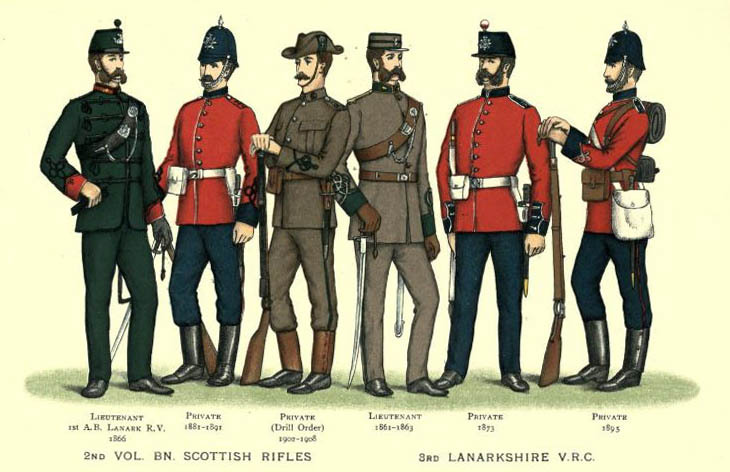 Inspired by the first international football match, Scotland vs England, in which three of its members played, the 3rd Lanarkshire Rifle Volunteers form their own team on 12th December 1872. They practice on the parade ground north of Strathbungo village. Third Lanark go on to win the FA Cup, twice. First against Celtic in 1889, then Rangers in 1905. Oh, and the Football League in 1904. 18-25 Moray Place, constructed by William Brown 1872-73, first occupied 1874. Strathbungo Station opened 1st December, with the line extended over the Clyde to the new St Enoch Station in Glasgow. Mr James Brown issued the first ticket. 26-33 Moray Place built in 1876-7 (no 31 first occupied 1877, the rest 1878). Titwood Place was completed on the north side of Matilda Place in 1877 to a "Greek" Thomson design by his partner Robert Turnbull after his death. Matilda Place was renamed Nithsdale Road c 1895. William Howie & Son build Matilda Terrace on the south side of Matilda Place in 1878. Matilda Place was renamed Nithsdale Road c 1895. 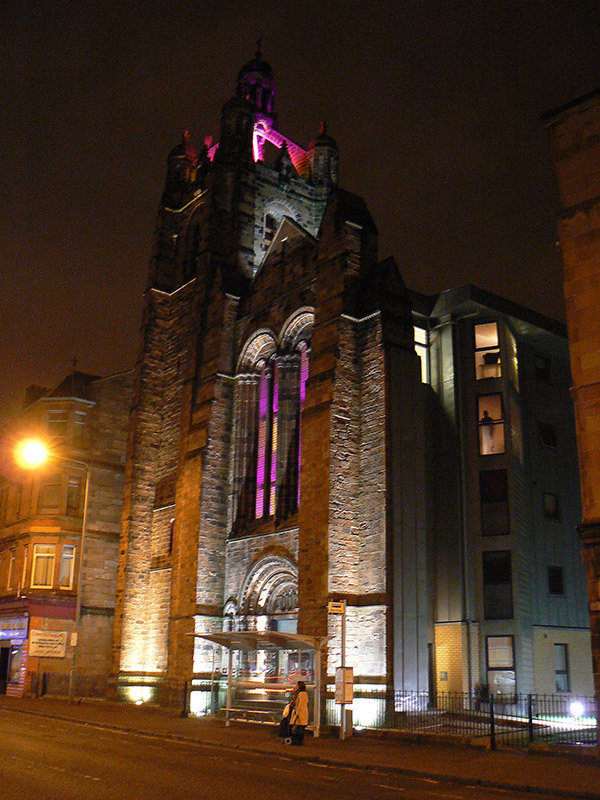 First Strathbungo Parish Church extended, with addition of a gallery. 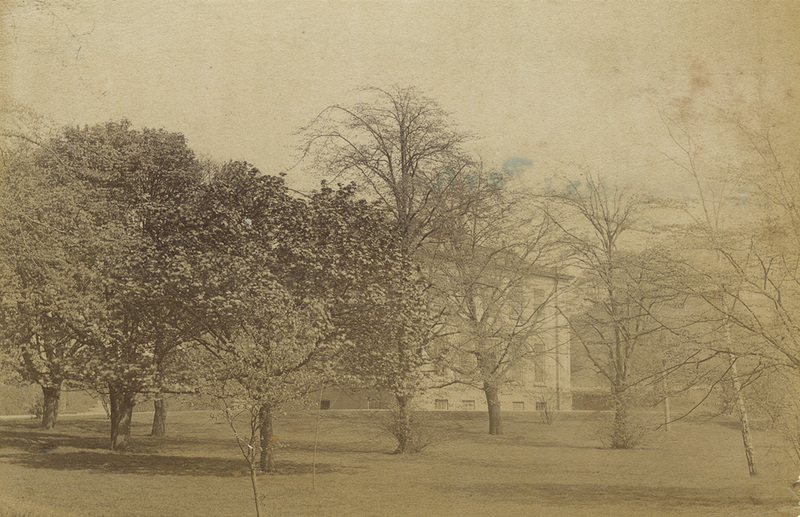 The south side of Queen Square was occupied 1879-80, the date inscribed on the urn placed above the front doors half way along the street. Built by Alexander Thomson (no relation) and Robert Anderson. The north side of Marywood Square, originally called Prince Square to conform with the royal theme of the development, is first occupied in 1878-9. The builder was Robert Weir. 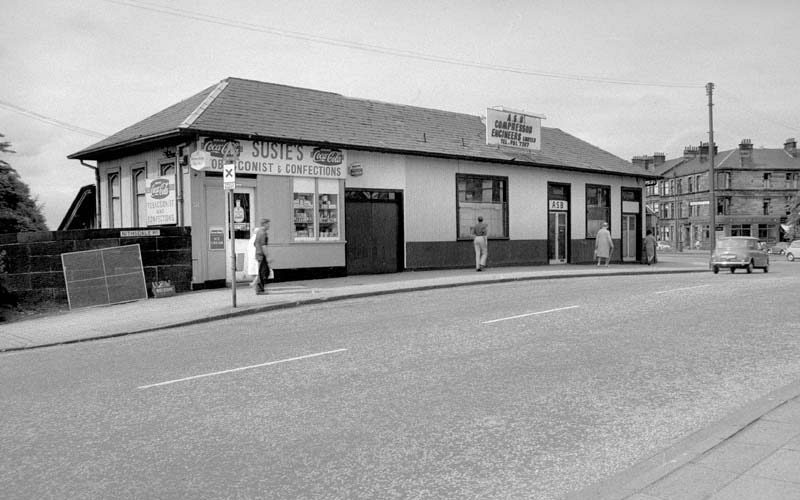 Salisbury Crescent built on the corner of Nithsdale Drive and Street by Robert Turnbull. 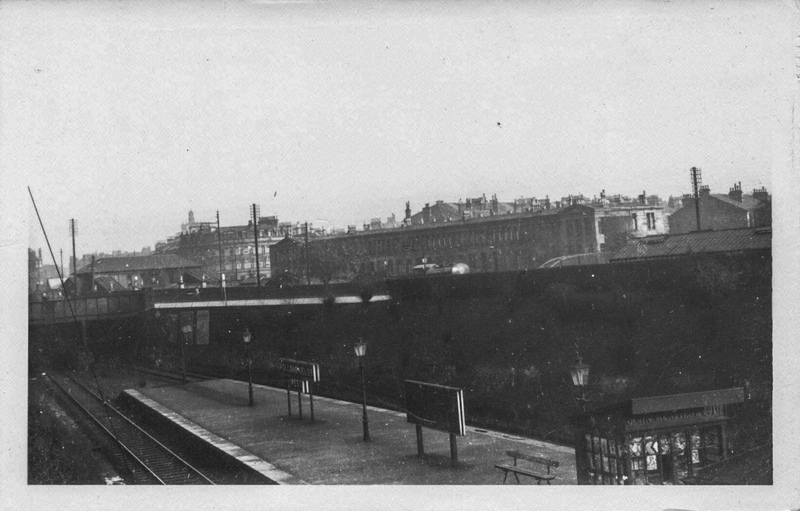 Queen's Park Station, and the eastern half of the Cathcart Circle, opened on 1 March 1886, providing a line to Mount Florida, and in May 1886, to Cathcart. The western half did not open until 1894. 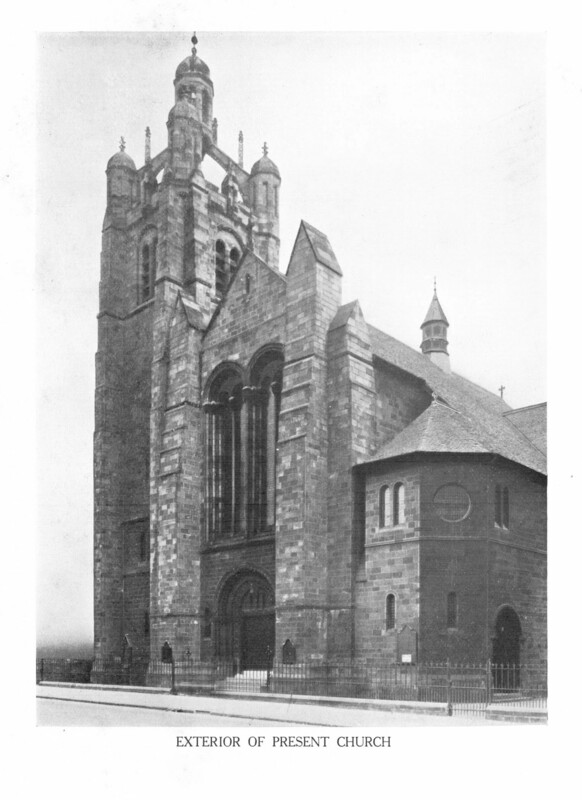 Second Strathbungo Parish Church constructed, John McKissack, architect. Foundation stone laid October 1887. Nithsdale Mission Hall built by the U.P. 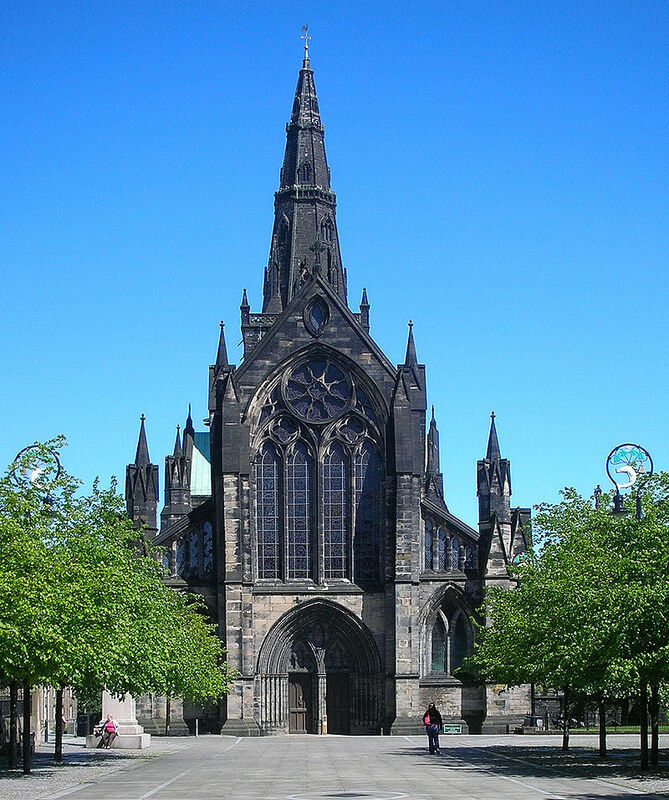 Church to Alexander Skirving's design. The south side of Marywood Square was built nearly ten years after the north side, but in the same style, being first occupied between 1886 and 1888. 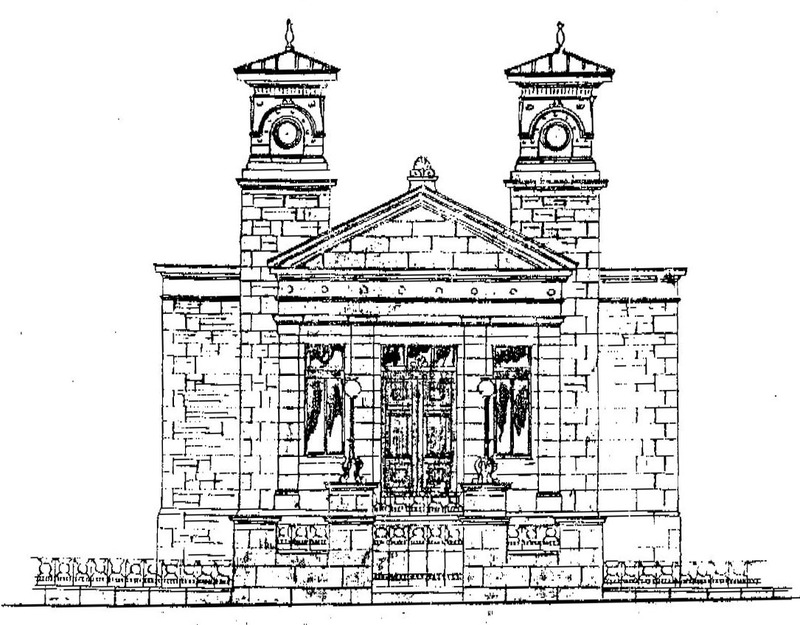 Nithsdale Mission Hall was completed by the United Presbyterians, to a design by Alexander Skirving. The western half of the Cathcart Circle, including Pollokshields West Station, opened on 2 April 1894. Hutchesons' Girls' Grammar School transferred from Elgin Street (now Turriff Street) to the new site in Strathbungo at Kingarth Street. Hutchesons' Primary School still occupies the site today. The Gardens are completed by James Wright; Vennard (after his mother), Thorncliffe, Carswell and Moray Place. The south side of Carswell Gardens is built to a slightly different design by William Todd Aitkenhead. 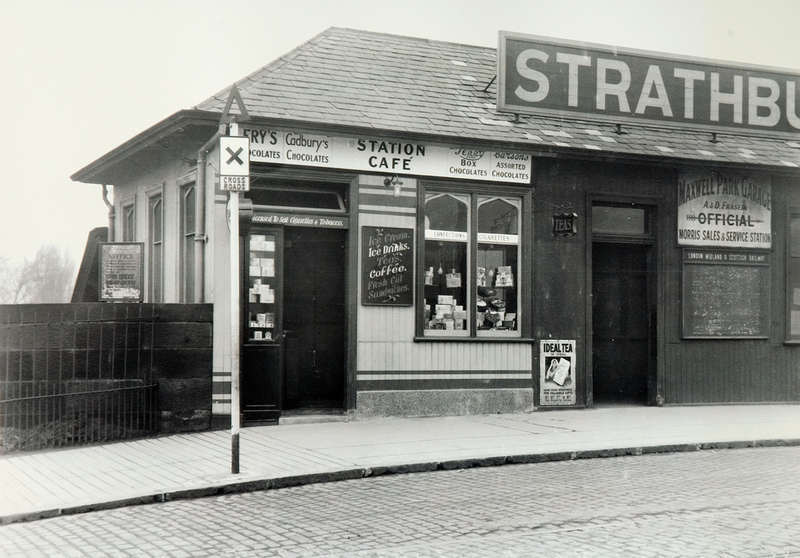 Strathbungo Station closed 28th May 1962. 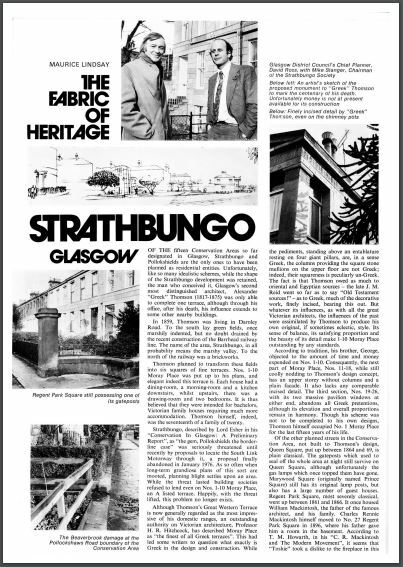 The Strathbungo Society is formed to help preserve the architecture and character of the area between Nithsdale Drive and the Gardens. 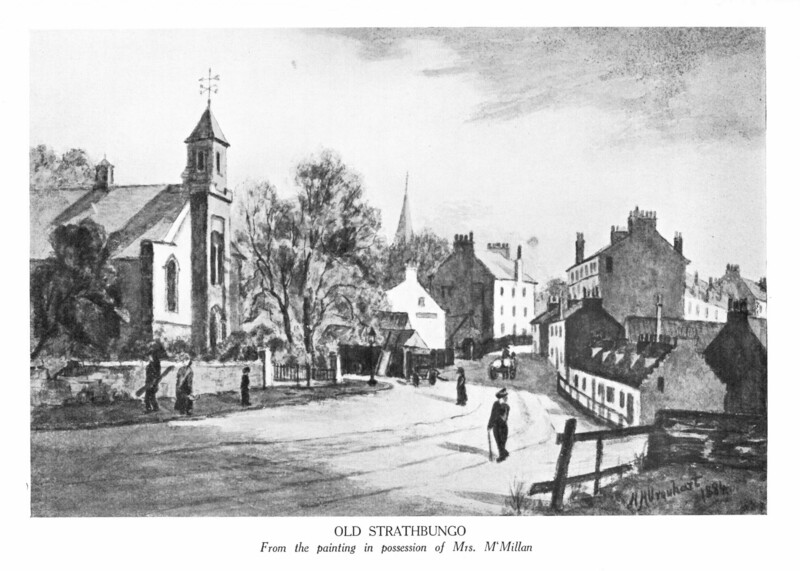 Strathbungo is granted Conservation Area status, initially from Nithsdale Road to the Gardens. In 1978 this is revised to remove the gardens but include Nithsdale Street and Drive. Strathbungo Parish Church closed to worshippers in May 1979, before falling into dereliction. 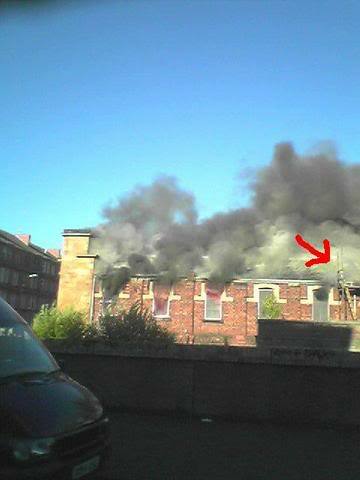 Nithsdale Mission Hall severely damaged by fire, and currently awaits restoration. 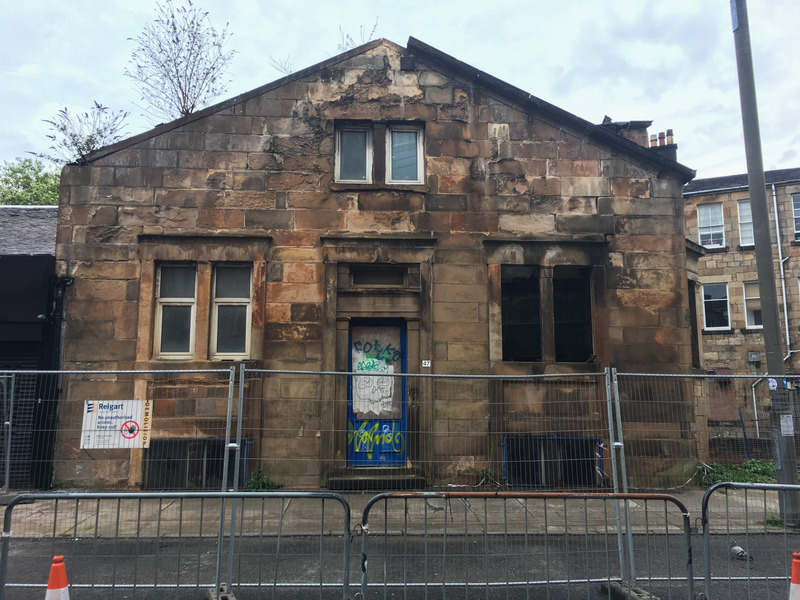 Possibly the first building to be lost within Strathbungo Conservation Area, 47 Nithsdale Road was allowed to fall into disrepair by its owner, and it was demolished after it became unsafe. The origins of the building are unclear, but it formed one end pavillion of a range of buildings that previously housed a motor garage. Who knows? Why not join the Strathbungo Society and shape it yourself?